There are countless stories about how baseball players broke into the game. Some made spectacular first impressions while others left no impression at all. The year was 1918 and 20-year-old Rube Lutzke was badgering manager Mike Kelley of the St. Paul Saints of the American Association for a chance to show his talent. Finally, on June 23 Kelley told Lutzke that he would start in right field versus Columbus. “But I’m an infielder,” exclaimed Rube. “I can’t play the outfield.”1 Nevertheless, Lutzke started the game in right field. With two outs in the ninth, Saints pitcher Charley Hall was cruising along with a no-hitter. The last Columbus batter sent a towering fly ball toward right field. Lutzke circled under it looking very insecure and just as it neared his head he thrust up his glove and recorded the final out. Rube played three more games in the outfield for the Saints and never made any errors. He also never made a hit and was released. Walter John Lutzke was born on November 17, 1897, to Wilhelm and Marie (Mertes) Lutzke in Milwaukee. Wilhelm had traveled from Prussia to America in 1868 with his parents and three siblings. The family settled in Wisconsin, where Wilhelm eventually found work in a tin shop before taking a job as a trucker with the railroad. He and Marie were wed on Valentine’s Day in 1880. Marie gave birth to six boys — Fred, Willie, Charles, Otto, Arthur, and Walter. Wilhelm died in the early 1900s, forcing Marie to become a laundress. Fred and Charles still lived at home and worked as a delivery driver and tinner, respectively. In 1919, Charley Moll of the Class C Winnipeg Maroons signed Lutzke for the Western Canada League. The Maroons won the first-half title, but then collapsed and finished last in the second half. Nevertheless, they earned the chance to face Saskatoon in the nine-game championship. The Maroons dropped the series, five games to three. Lutzke batted .292 in 100 games. Over the offseason Lutzke signed with Connie Mack, but then his rights were transferred to the White Sox, who eventually sold him to Milwaukee. The Brewers finished in the second division. Lutzke’s fielding won praise, but his .228 batting average was by far the worst of the starters. In fact, it was the worst in the league for any player with 100 games or more. Lutzke butted heads with manager Jack Egan. The worst confrontation came on a day when Joe Hauser, the first baseman, and Lutzke made multiple errors. Egan complained that the team would be better off without the “krautheads.” Lutzke snapped back, “Good managers don’t talk that way.”4Egan apologized but in October Lutzke was traded to Indianapolis for pitcher George Gaw. The Indianapolis Indians had veteran Doug Baird at third base. He had over 600 games’ experience in the majors and had the speed that manager Jack Hendricks wanted at the top of his order. Near the end of spring training Baird was spiked in the calf and Lutzke started the season at third base. His fielding was excellent but his hitting was atrocious. When Baird healed, he was immediately put back into the lineup. Lutzke was tried at first base when Sam Covington was injured, but his footwork proved to be a problem. Hendricks benched Lutzke, who claimed that he was “not getting a fair chance.”5 Lutzke jumped the team and returned home to Milwaukee. He had played in 13 games and was batting .140.6The Indians suspended him and on June 7 they accepted the $2,000 waiver offer from Kansas City in exchange for Lutzke. The Kansas City Blues were an offensive juggernaut led by Bunny Brief, who belted 42 home runs and had a .361 batting average. Brief wasn’t even the team’s batting leader; that honor went to teammate Art Butler at .368. Lutzke was eighth in batting on the team at .296. However, if you remove his 6-for-43 performance in Indianapolis, he batted .317 with the Blues, who finished in third place. The 1922 Blues repeated with a third-place finish and a potent offense. Lutzke belted a career-high 11 home runs and batted a career-best .325. He was traded to Cleveland on November 5 for two players to be selected in the spring. Kansas City also received $25,000. Lutzke was generally regarded as the best third baseman in the minors in 1922. He stood 5-feet- 11-inches tall and weighed 175 pounds. He batted and threw right-handed. He supposedly had the biggest pair of hands “in baseball captivity”7His fielding of slow rollers and bunts was compared to that of Cleveland’s Bill Bradley. 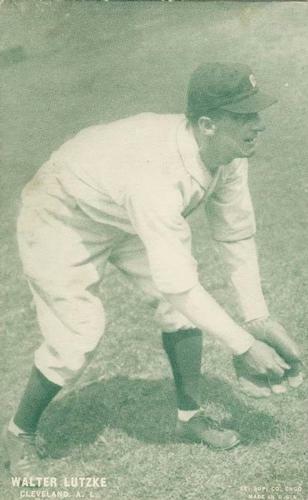 Pundits raved that “he could go full tilt to the left for a ball … and then whip it to first without stopping or turning.”8Lutzke replaced veteran Larry Gardner at the hot corner for Cleveland in 1923. Lutzke opened the season against the Chicago White Sox but had only one hit in Cleveland’s three-game sweep. It was then revealed that he was playing with tonsillitis. He missed four games and continued to struggle at bat until the weather warmed in May. Lutzke peaked in July, when from July 11 to the 14th he had four multi-hit games, scored five times and had eight RBIs. The streak boosted his average to .286. But Lutzke tired in September and closed out his rookie year batting .256. The Tribe stumbled in 1924 and finished well under .500. Lutzke’s health contributed to the fall. He contracted blood poisoning during spring training. This was followed by two more bouts with illness that required bedrest. He missed two weeks in June when Larry Gardner showed he was no longer able to handle the position. This forced Cleveland to trade for Frank Ellerbe from the St. Louis Browns. Lutzke returned to the field and played until late August, when he was shut down for the rest of the year. His fielding numbers did not suffer, but his batting average dropped to .243. In 1925 Lutzke again struggled with health issues. He had 14 teeth extracted during spring training and did not have a start until May 11. He never got his batting eye and had to battle illness the entire season. He was hospitalized and lost quite a bit of weight. He made only 81 appearances and batted .218. When Lutzke and his wife arrived for spring training in Lakeland, Florida, in 1926, he arrived in great shape with a new attitude. They had spent the winter in northern Wisconsin and Lutzke had spent the winter cutting wood and ice. He said, “I decided to become an optimist instead of a pessimist this year. Everything is going to be all right instead of all wrong this summer.”9 Finally healthy, Lutzke won the third-base job in competition with Johnny Hodapp, who had been acquired from Indianapolis. He played 142 games and batted .261. Lutzke’s glove work was excellent and won comparisons with that of slick-fielding Willie Kamm of the White Sox. Lutzke spent the winter of 1926-27 in the wilds of Wisconsin again, and reported to Lakeland and new manager Jack McCallister in fine shape. It was not long before a newspaper headline screamed that Lutzke would have “His Greatest Year.”10 Lutzke had given up bowling and was hitting and fielding better than ever. “Barring accidents the Cleveland fans will not have to worry about Lutzke…”11On May 24, Lutzke was batting .300 and headed for a fine season when he broke a finger. The injury and the hot hitting of Hodapp kept Lutzke on the pines until July, when he regained his spot. His timing at the plate was off and his average fell into the .230s. He recovered slightly to finish the season at .251 with very little power. The Indians opted to go with Hodapp in 1928 and Lutzke was sold to the Newark Bears. Lutzke returned to the Wisconsin State League with the Racine Belles. He was team captain and a leading hitter for the team that won the league title. They played Wisconsin Rapids, champion of the Fox River Valley League, in a best-of-three series for bragging rights to the state. The Belles won the first match and then Lutzke hammered two home runs and drove in five runs in the clinching 16-2 victory. Lutzke was a member of several lodges and groups, including the Masons and Eagles. He found work at a tavern where no doubt baseball was the leading topic of conversation. In 1935 he became too ill to work any longer. He was bedridden for more than a month when he died on March 6, 1938. He is buried in Valhalla Memorial Cemetery in Milwaukee. This biography was reviewed by Len Levin and fact-checked by David Kritzler. 1 Manning Vaughan, “Putting ’em on the Pan,” Milwaukee Journal, March 11, 1931: 27. 2 “Edelbrau Fans Hope Weather Is Favorable,” Sheboygan Press, September 16, 1915: 3. 3 A family tree attached to ancestry.com suggests the marriage took place in 1919. However, Clara is listed as the spouse on Lutzke’s draft registration from 1918. 4 “Lutzke Is Dead,” Milwaukee Journal, March 7, 1938: 18. 5 “Player has ‘Kiddish’ Ideas,” Richmond (Indiana) Palladium-Item, May 26, 1921: 11. 6 League Stats published in the Indianapolis Star, May 29, 1921: 34. 7 Chris Walfourt, “Lutzke May Return,” Sheboygan Press, April 8, 1930: 14. 8 Norman E. Brown, “The Fanning Beehive,” Eau Claire (Wisconsin) Leader, February 14, 1923: 2. 9 Wisconsin Rapids Daily Tribune, March 20, 1926: 5. 10 Henry P. Edwards, “Rube Lutzke Due for His Greatest Year With Tribe,” Cleveland Plain Dealer, March 6, 1927: 24. 13 George Buchanan, “Sliding Home With Father Time,” Sheboygan Press, February 20, 1930: 13.